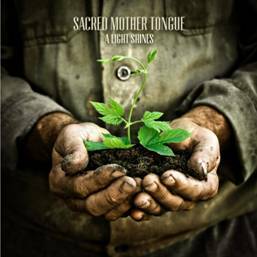 As previously announced EMI Label Services release ‘A Light Shines’, Sacred Mother Tongue’s brand new EP on September 3rd. This is their debut release on EMI Label Services and precedes their second album, ‘Out Of The Darkness’, which will be released early next year. The EP tracklisting has changed slightly to include another brand new track ‘Bleeding Out’, which will also feature on the album ‘Out Of The Darkness’ when it is unveiled in early 2013. This sits alongside the lead track ‘Evolve/Become’, whose stunning futuristic video – from which the ‘A Light Shines’ cover art is taken – will be unveiled soon. The two other tracks on the EP are ‘Seven’, (view the lyric video on Sacred Mother Tongue TV) and ‘The City Is Crying’, which was recorded live in China on the band’s recent tour there. All four tracks are brand new compositions and set the tone for the grand scope and ambition of ‘Out Of The Darkness’. Sacred Mother Tongue unveiled yet another new track from next year’s album at their packed showcase last week at The Intrepid Fox in London’s West End. 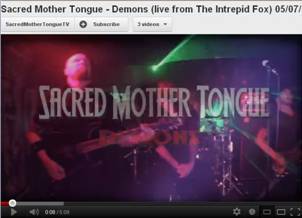 Their blistering performance of that track, ‘Demons’, can now be viewed online too by clicking here. Well worth watching, it’s dramatic evidence of Sacred Mother Tongue’s determination to reach the highest echelons of rock and stake their claim on festival stages around the world next year. It is released on September 3rd via EMI Label Services. I did sound for these guys once. Decent music and they weren’t a bunch of dicks. Ranks them fairly high for me. And you need to sort out the background on your comments. They end up bloody unreadable. And your Facebook box isn’t working. I know. It’s a work in progress. Stupid theme. And this is why I build my own.